Dan Ariely’s ‘Predictably Irrational’ is an enjoyable combination of consumer behavior and psychology. The book, originally published in 2008, explains why people act in a way counterintuitive to their best interests, no matter how irrational it might appear. 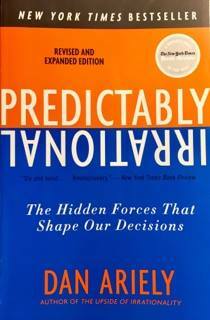 Ariely’s book focuses on the predictable patterns people form, and thus ‘Predictably Irrational’ is a fun way to learn about behaviors ruling your life, even those you are unaware of. I absolutely loved ‘Predictably Irrational.’ It was not only easy to read but also entertaining. Ariely’s style of writing is amazing. He has a tongue in cheek humor that makes potentially boring information fun, and he is great at weaving a story. Rather than explaining each research study in analytical terms, Ariely presents his research as a story, making the non-fiction book feel like a narrative. Another benefit to Ariely’s style of writing is how he explains his personal experience through the book, making him feel relatable as opposed to an all-knowing researcher. Whether it is him describing the awkwardness that comes with seeing a student outside of class, or talking about his experience with pain after 70% of his body was covered in third-degree burns, the personal touch gives ‘Predictably Irrational’ a more genuine feel that enhances the quality of the book. I also enjoyed the way the information is presented. Each concept is presented by detailing the story of the research, emulating case based learning. I found it interesting how Ariely decided to present his findings not by presenting the results first and showing how they were discovered, but by describing how the concept was thought up, how the research was run, and what the results were. I personally find case based learning to be very helpful in my own classes, and I felt that by presenting the information in this way Ariely involves readers more, making them feel like they were discovering the results with Ariely, rather than just learning about his results. One of the best things by far was the amount of information Ariely managed to pack into one book. He covered tons of concepts I had learned in my consumer behavior class, and so much more on top of that. Ariely explains fascinating research in ‘Predictably Irrational.’ He talks about how numbers as arbitrary as the last two digits of your social security number can influence the amount you are willing to bid on items, how the idea of something being free makes you more likely to give up better offers but at the same time less selfish, and how owning something can distort what you perceive the value of your belongings to be. Ariely’s research is fascinating and has the potential to teach readers quite a lot about irrational habits they themselves perform. While I enjoyed the examples Ariely gave, and the lessons learned, at times I wasn’t sure what exactly I could gain from them. While it is interesting to know, for instance, that the placebo effect is so strong that taking more expensive Advil can make me feel better than a generic Advil, I can’t do much with this information. If anything knowing that certain drugs Ariely describes are mostly placebos makes me unlikely to continue to have the positive effects from them. ‘Predictably Irrational’ could have benefited from a couple of paragraphs at the end of each chapter explaining how someone could have moved forward with the knowledge being provided. While I have recently begun developing an interest in research, what I find most interesting is how the results of research are applied, which I believe gives the research that much more value. Another thing that I can see being a drawback from ‘Predictably Irrational’ is the fact that it could be watered down into a single article, or a series of articles. While I found the book easy to read and interesting, I can see how Ariely could shorten his points. I know that the examples of studies given have been written about in Ariely’s academic papers, but for the average person, I think some examples could be shortened or removed for brevity’s sake. For example, in my consumer behavior class this past semester we studied anchoring, a topic Ariely covers in his book. Because Ariely is an expert on the subject, in class we watched a video he had created. The video was no more than five minutes long and I felt as though I had as clear of an understanding of anchoring as I did after the chapters covering it in ‘Predictably Irrational.’ While I love the multiple case studies because it gave the book a novel-like feel, I think that other readers might prefer fewer examples and more research results. I absolutely loved this book, and would most definitely recommend it to people, especially those in marketing looking to better understand consumer behavior. Ariely’s book is just plain interesting, so if you are looking for a book that’s informative, while enjoyable and easy to read, this is the book for you. This entry was posted in Book Review, Business and tagged book-review, business-book-club, consumer-behavior, predictably-irrational. Bookmark the permalink.